Gutter Cleaning in the City of Oaks Can be a challenging undertaking. Especially if you have a larger home with steep roof lines and a lot of trees. Typically, cleaning your gutters three or four times a year during the spring and fall will keep them flowing properly. Many homeowners only clean their gutters once a year and the gutters are so full and packed by then you almost need a roto-rooter to clear the downspouts. Most properties have a mixture of trees so the debris is a mixture of leaves, pine needles and twigs. However some have only pine trees and since pine trees shed small amounts of pine needles throughout the year these homeowners have to clean gutters much more frequently. Take a look at the picture below of one full year of no gutter cleaning. Clogged downspouts can totally block water from draining and usually causes the gutter to overflow right above the downspout. 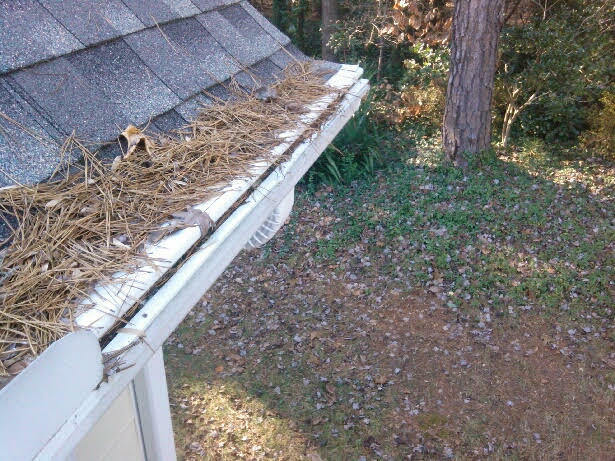 If left unattended the water damage to the fascia and wood behind and below the gutters will grow every year until the downspout is cleared. Gutter cleaning can be one of the cheapest home maintenance services you purchase but yet saves you the most money on home repairs. Nobody wants to pay for rotten wood and damaged foundations, or washed our flowerbeds and natural areas. Find yourself a local company that can keep your gutter cleaned regularly three or four times a year and avoid expensive gutter related repairs! Installing a gutter guard sounds like a good thing right? You wont have to clean the gutters anymore, and all that rain water will go down inside the gutter and debris will be kept out. 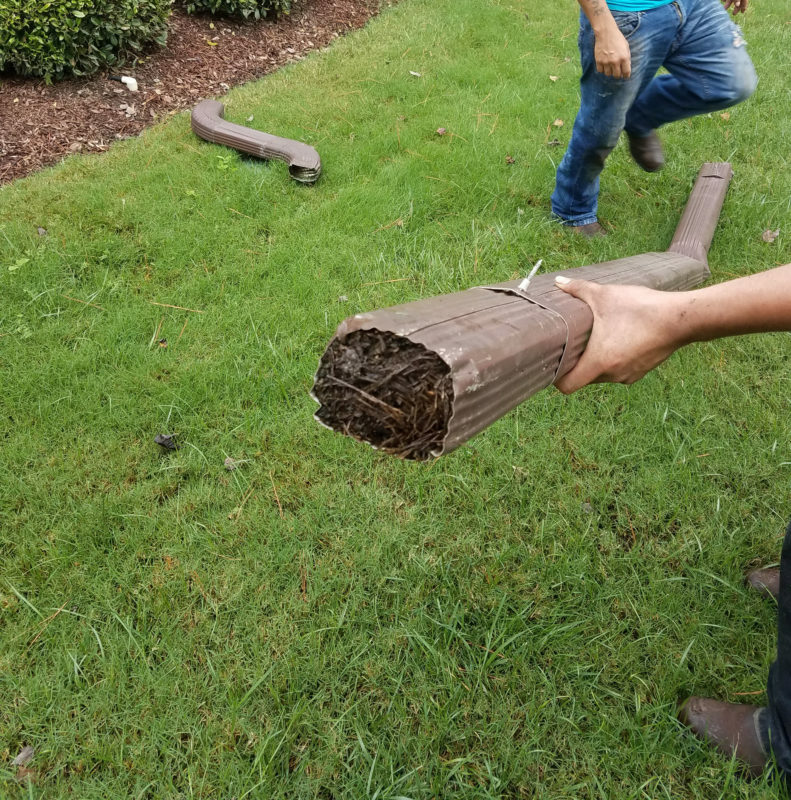 Think again, 95% of all gutter guards fail, and depending on the density, proximity and type of trees near your home that failure can be sooner rather than later. Don’t be fooled by inferior gutter guard products claiming never to need cleaning or maintenance. This does not exist in the marketplace! Lifetime Gutter Company’s experience in the field cleaning gutters has been a 25 year ongoing observation of every gutter guard product in existence. Thousands of homeowners have called us over the years and asked that we remove or service their failing gutter guards. On all of which, the gutter guard had to be completely removed in order to clean the gutters beneath. 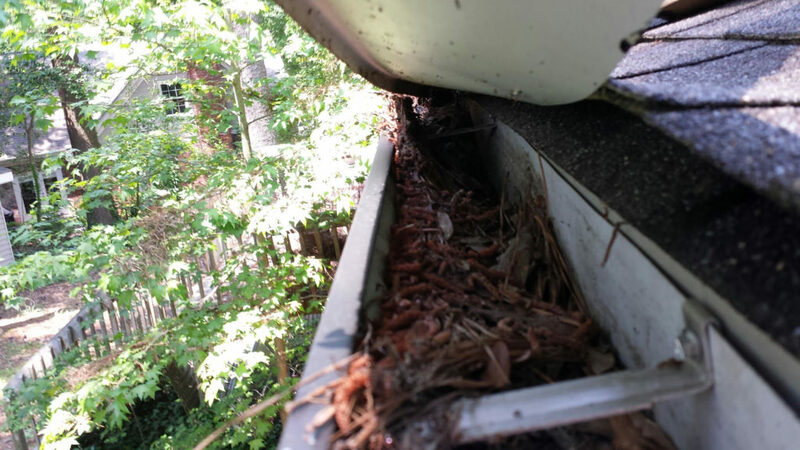 Some customers went through this process for years until they grew tired watching their gutters overflow and of paying for these multiple steps to remove, clean then reinstall the failing gutter guards over and over again. Most customers simply requested the guard be removed and disposed of, deciding to clean periodically and end the hassle. Here are a few clogged gutter guards we encountered this week, imagine how many we’ve seen in 25 years. Keeping your gutters cleaned regularly can save you a lot of money on repairing rotten wood. As you can see in the picture below, this fascia is completely rotten and looks as if the gutters haven’t been cleaned in years. Another culprit can be undersized gutters, if your gutter system isn’t capable of handling high volumes of rain water during a storm the fascias and soffit trims will suffer repeated water damage when the gutters overflow. By having an adequately sized gutter system and keeping it cleaned periodically your gutters will work correctly for many years to come. 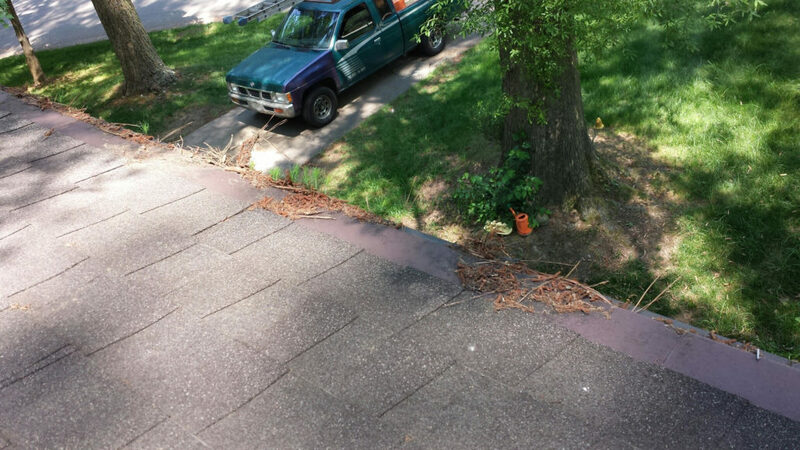 “We just wanted to thank you for taking care of our gutter replacement on our home. It was a pleasure to have you and your team on our property; they were conscious of our landscaping and your cleanup afterwards was superb. After years of watching the rain cascade over our roof outside our dining room window, it’s great to finally have a working gutter.